Executive Chef Nico Chessa is a native of Sardinia and has worked throughout Italy mastering the special dishes of each region. Nico had the privilege to be the executive Chef for the gala reopening of the Sistine Chapel and served Pope John Paul II. He joined the Valentino Restaurant Group in 2003 and is currently the Executive Chef at Ristorante Giorgio in the Mandalay Place in Las Vegas. Nico's culinary artistry is focused on truly authentic Italian dishes. Giorgio Ristorante offered a Three Course "Ides of March" Roman Themed Menu to celebrate Julius Cesar's last day as ruler of Rome. The entree dish showed off Nico's passion for authentic Italian fare. The idea of a caramelized yellow onion with Lamb stew in one side and herb spelt in the other was very original and our favorite of the night. The Best wine pairing of the evening came with dessert. Not only is the food delightful but the interior of the restaurant is lovely featuring an incredible hand blown crystal glass bar imported from Italy. Stop by and have a cocktail and appreciate this work of art. Giorgio Ristorante, the casual expression of its partner restaurant, Valentino Las Vegas (located inside the Venetian Resort) specializes in both traditional and contemporary Italian dishes and reflects Sardinian Executive Chef Nico Chessa’s versatility with home-style cooking and authentic Italian ingredients. Giorgio Ristorante boasts one of the best appointed private dining venues on the Strip, ideal for wedding receptions, corporate events, holiday parties and banquets for up to 200 people. The restaurant is easily accessed via the Mandalay Place valet parking on Mandalay Bay Road between the Mandalay Bay and Luxor casinos. The restaurant’s hours are 11am to 10pm (MON-FRI) and 12pm to 10pm (SAT-SUN). Learn more at www.giorgioristorante.com or call (702) 920-2700. Join Elaine from Vino Las Vegas as she enjoys some traditional Roman fare and speaks with Executive Chef Nico Chessa about his background and his culinary artistry. We have traveled through the beautiful Edna valley in the past. Located outside of San Louis Opispo , it is worth a visit. Claiborne&Churchill is a must stop. This is a a small, family owned and operated winery, founded in 1983. They make excellent Alsace style wines and specialize in premium dry wines made from Riesling, Gewürztraminer, and Pinot Gris grapes, as well as handcrafted Pinot Noir from several nearby vineyards. They also produce small lots of other wines, including a Dry Muscat, Chardonnay, Syrah, Cabernet Sauvignon, Sparkling Brut Rose, and a Port-style wine. Owners Claiborne (Clay) Thompson and Fredericka Churchill. have an incredible story of their journey to own a winery. They are both former teachers at the University of Michigan and left for the vineyards of California in 1981 in order to start a new life in the wine industry. Clay began as a "cellar rat" in a local winery, learning the business from the ground up and soon they started their own wine production in that host facility. In 1995 Clay and Fredericka took their dream one step further and completed construction on their new and permanent winery building. The structure is an example of environmental architecture, a "straw bale building," the first of its kind in California. With sixteen-inch thick walls made of bales of rice straw, the winery is so well insulated that it maintains a constant cellar temperature, without the need for mechanical cooling or heating. for themselves in this industry dominated in the past by Legends. We used to describe Coby as a young and up-coming winemaker. That description in our opinion no longer applies. Coby is young but he has arrived has a home at Claiborne&Churchill. Join Scott from VINO LAS VEGAS as he speaks with Coby about how he got started in the industry and his current projects in the tasting room at Claiborne&Churchill. For more information about these great wines, please go to Claibornechurchill.com. event we look forward to the most is the World of Pinot Noir. The idea for the World of Pinot Noir began when a few local winemakers would gather to share and talk about their Pinot Noirs. This event has grown into one of the largest gatherings of Pinot Noir winemakers and vineyard owners in the world. And they meet in Shell Beach California at the beautiful Cliffs Resort over looking the Pacific Ocean. no exception. There were more seminars , dinners , and other events this year than there have ever been before. If there is a heaven for Pinot lovers this must be it ! The Regional seminars included New Zealand , Santa Cruz and even Austria. Of course you can't leave out the Burgundy region of France when talking about Pinot Noirs. This year WOPN featured Domaine Henri Gouges from Nuits St George and Pierre Gouges hosted the Burgundian Seminar which was a big hit. Las Vegas Master Sommelier William Sherer took his annual position as moderator for the very popular Iron Sommelier Challenge a very interactive event with food pairing. This year there were two Gala Dinners that featured World Class Chef Craig von Foester from Sierra Mar Restaurant at Post Ranch Inn , Big Sur , California and Chef Evan Treadwell of The Lido at the Dolphin Bay Resort and Spa , Shell Beach. We had the pleasure of attending Chef von Foester's dinner at the Cliffs Resort and sampled his culinary skills as he prepared a four course Pinot Noir Dinner. There are many highlights to the World of Pinot Noir. But the two tasting events over looking the Pacific ocean are hard to beat. The Focus tasting is a walk around tasting that features 102 wineries , importers and even a silent auction of magnums. As the many guests strolled and tasted these great wines they were treated with light hors d oeuvres and great Cheese from the famous The Cheese Shop, Carmel and Santa Barbara. The Tasting by the Sea was a bigger event and featured 124 different wineries and of course that great Cheese and hors d oeuvres. Where else can you have the chance to sample well known Pinot Noirs and speak to the winemakers like Seasmoke, Curran, Cargasacchi, Fiddlehead, Ampelos, Tudor, Ken Brown and Kenneth Volk just to name a few. true art of making fine Pinot Noir. 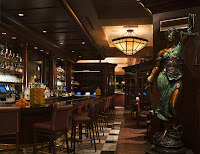 The Capital Grille has a very fine national reputation . When we were invited to take place in a little bit of culinary history we could not turn it down. This renowned restaurant paired with Tuscan winemaker Castello Banfi for the United States debut of its BelnerO Sangiovese di Montalcino 2005 which is a highly allocated vintage. the 90th year as the United States leading importer of fine wine having begun in 1919. In 1978 John and Harry Mariani, owners of the U.S. wine importer Banfi Vintners, established the award winning vineyard estate and winery Castello Banfi in the Brunello region of Tuscany. A constellation of single vineyards located on ideal sites cover about one third of the 7,100 acre (2,830 hectares) estate. The remaining land consists of bucolic meadows, olive and plum groves, and woodland. Central to the property is a medieval castle that functions as a hospitality center, hosting visitors at a full service restaurant, enoteca and museum dedicated to the history of glass and its relation to wine. To celebrate this great occasion The Capital Grille offers a 5 course Italian dinner for $49.00 per person from February 23 to April 5 2009. The wine is not included but we had the BelnerO and highly suggest it as the menu was designed to pair with each course. At $69.00 per bottle it its well worth it ! We had the opportunity to speak with Executive Chef David Sacco and Managing Partner/Wine Director Stephen Palermo about the food and pairing of the BelnerO with the dinner. to the meal with flavors that just explode with the chive oil being a real stand out. Sorbetto DI Limone Al Basilico provided us with a nice intermezzo and was a favorite of ours with the basil adding a nice touch. We each had a different Entree and both were very good. The Pesce Spada in Cartoccio was a real stand out and was so tender it melted in my mouth with the parchment paper keeping the roasted tomatoes , olives and capers full of flavor to the end. And of course the Maccheroni Al Forno in Creama DI Mascarpone con Tartufo was one we will not forget. The shaved black truffle added to the layers of flavors of this dish. To finish , the housemade Biscotti in the Gelato Fatto in Casa con Salsa Cioccolato was a nice end to a great meal. The BelnerO Sangiovese di Montalcino paired nicely with every course . Chef Sacco and Wine Director Stephen Palermo did a great job putting these pairings together. The pairing that really stood our for us was the Swordfish Roasted inside Parchment paper. That dish will be rememberd for a while. 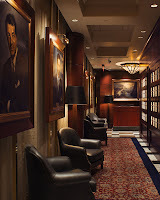 The Capital Grille has a wine list with over 350 international selections and also offers a Captains List that features rare and vintage wines from all over the world. They even offer a wine locker membership for those who value their "special bottles ". The reputation of the Capital Grille is well deserved and we raise our glass of BelnerO to Chef David Sacco , Managing Partner/Wine Director Stephen Palermo and our Sommelier /Server Corey Bohanan and say Cheers for a job well done ! Join Scott from VINO LAS VEGAS as he sits down 3 stories above the Las Vegas strip and speaks to Executive Chef David Sacco and Managing Partner/Wine Director Stephen Palermo about the dinner, the wine and what the Capital Grille has to offer.